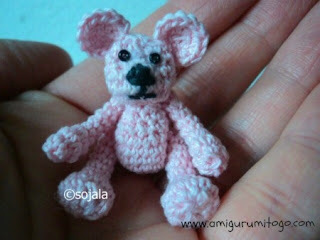 Special notes: This is my 3rd miniature bear I've ever made so I'm no expert for sure. But I wanted to give it a try so I can fill my dollhouses with miniature crochet characters! This pattern will give you a basic bear and the video tutorial to go with the written pattern. I used crochet thread #10 and a 1.25 mm hook and worked in continuous rounds. Have any questions or if you come across a mistake in the pattern please leave a message in the comment section below. 9) 2tog for one row. Close up any opening left with needle, shape hand a bit, cut free leaving long tail for sewing. Pull remainder thread up and out the other end of arm, use that to sew arm to body. 11) 2tog twice then stuff remainder of foot. Close up any opening left with needle, shape foot as much as you can. Cut free and leave long tail for sewing. Pull thread up through leg and out the other end while pulling the bottom of the foot flat. I stitched the nose in with black crochet thread. The eyes are tiny beads that I sewed on with clear thread. So there you have it! I plan to make more miniature bears. I do hope to get better with time and practice so stay tuned for upcoming tiny crochet critters! Sharon, your tiny bear is so sweet. What an interesting concept to fill your doll house with characters you crocheted! Thanks. Es muy hermoso y tu eres muy generosa por compartir las instrucciones. muchas gracias! Fuerte abrazo para ti!! All the best to you and please feel free to drop a line if there's anything I can help with along the way that the video may not cover. Thanks so much! Love the bear, i made one and it turned out perfect thanks to your wonderful pattern! Ms Ojala, this is the first time i've made anything using crochet other than a blanket and the first time i've successfully used a pattern. Your video's made it easy to follow, thank you very much! I just made a blue and white bear and he's adorable. Since he's my first and I'm sentimental I called him Eddie. Thanks!!! Thanks so much for taking the time to comment, it was a delight to hear from you. hi! i just wanna ask if it's okay to use a .95 mm hook? what is the effect if i use that kind of hook? thanks! oh, I think so! If you can comfortable use it with your thread then the only difference would be a slightly smaller bear. The best thing to do is try a round or 2 and see how it feels. Hope that helps! Thanks for sharing your adorable teddy with the rest of the world. I am definitely going to crochet the teddy for my daughters and their friends. I'm going to save this in my Crafty Things blog, so I don't lose the pattern. Thank you very much for sharing your tiny bear pattern. It is so sweet !